I just tune it out. Then if I video something in the back garden all you can hear is plane noise. I still miss the evening fly past of Concorde - now that was loud. Its very quiet this morning and has been for the past hour or so. The reason seems to be that the planes don’t seem to be coming from the South. Does anyone have a take on what’s different this morning ? Not sure what good posting this does but makes me feel slightly better. When I have time, I will try to find out whether Lewisham has representation on HACC. The wind is from the West so today planes fly directly in to City from the East. They only go over us when wind is from the East and they come in over Catford, Forest Hill then turn North and finally turn East over the river for the landing. back in June 2017 this was a response from London City airport to my enquiry. It contains useful info on who does what and on how to track the course, origin, destination and height aircraft that came over your house on any particular day. I still haven’t quite got a handle on when we get the Heathrow flights over Forest Hill ones, but am fairly sure of what is happening with City airport flights. Whether Heathrow or City it all starts over us from 5am. We have one runway at London City Airport (LCA), and depending on the direction the aircraft are departing, which is dictated by wind direction, the runway is given a different designator, 27 (westerly) or 09 (easterly). Arriving aircraft only fly over parts of your area when we use runway 09. The direction aircraft must take off to depart or approach the airport to land is dictated by the wind direction i.e. if there is a wind blowing predominantly from the East to the West at the airport then easterly operations will occur. As you might appreciate, the airport cannot control these elements so the direction aircraft will fly can change from day to day. Also, it is worth noting that only 30% of all departures/arrivals during a year are easterly operations (known as Runway 09 departures/arrivals) since the prevailing wind at the airport is predominantly from the West during the year. Therefore, 70% of flights from London City Airport do not fly near your area. Aircraft movement over your area is determined by wind and you will notice that when the airport is operating on Runway 27 (westerly) you will not see any aircraft using LCA over your area. However you mentioned on the 28/06/2017 you noticed aircraft movement over your area. LCA was operating on runway 27 on that date so you would not have had any LCA aircraft over your area. You were definitely disturbed as a result of other Air traffic on that particular date. The routes flown by aircraft departing from and arriving to LCA are prescribed by Standard Instrument Departure (SID) and Standard Instrument Arrival Routes (STARs). These departure and arrival routes are established by the Civil Aviation Authority (CAA), and are designed to ensure safety within the UK’s skies. These routes are not decided by London City Airport. Recently London City Airport has launched a flight track keeping system (TraVis) which is used to view flight movements of departing and arriving aircraft operating at London City Airport within your area. This can be found on the LCA website via https://www.londoncityairport.com/home/page/track-aircraft-in-your-area. TraVis is a great tool for understanding LCA aircraft movements and the flight paths when on runway 09 and 27. TraVis will provide you with details of wind direction, runway usage, altitude etc. You can look up the required date and time and it will track aircraft movements. However there is a 60 minute live data delay. The associated routes for the Airport are still the same and LCA hasn’t changed its flight paths. However a change in how aircraft navigate when departing and arriving from the Airport has been introduced. This alternative form of navigation is called RNAV or Area Navigation. This is, in very general terms, satellite navigation for aircraft. This change came into effect from 4th February 2016 after it was approved by the Civil Aviation Authority (CAA). The change in Navigation referred to as LAMP is not optional – it is part of NATS’(National Air Traffic Services) wider programme to modernise the air route system over London and the South East issues on behalf of the CAA. This will require all aircraft to be equipped to navigate using RNAV by November 2017 and a mandate for the airspace to provide RNAV routes to be effective by winter 2019. As part of this change being adopted, a Post Implementation Review was required where LCA collated information for the 1st year after the implementation of RNAV in order to report to the CAA about the feedback and performance of this alteration of aircraft navigation. This has now been provided to the CAA with a decision from the CAA expected in the Autumn. There is an opportunity for you to contact the CAA direct on this matter with any statements or objections, by emailing infoservices@caa.co.uk. " 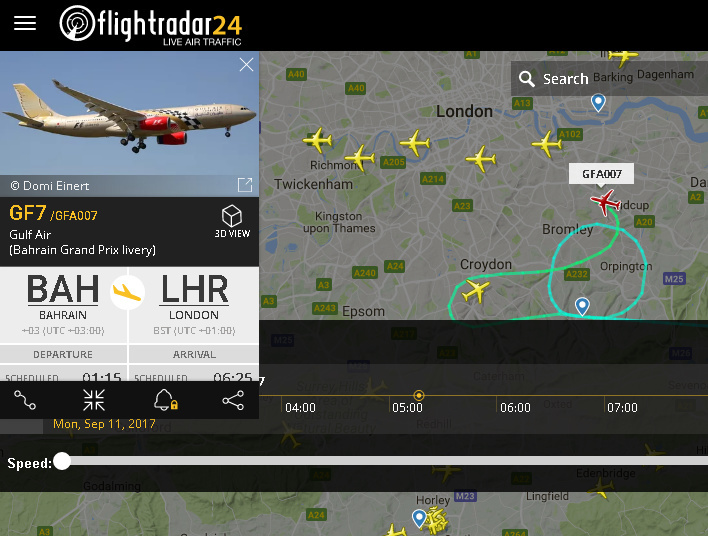 The web-site Flightradar24 (https://www.flightradar24.com ) not only lets you see current aircraft movements but also has a playback option. This permits you to set a playback window and show what aircraft flew through your sector at that time. You can then isolate any aircraft and identify it, its departure point and its intended destination. The attached image highlights what was flying over us this morning just after 5:00am. The loops should be interpreted as time spent in any stack. Wind from the west : Forest Hill gets Heathrow landings from 4.30-5.00am. coming in from a stack to the south of us. Wind from the east: Forest Hill gets all City airport landings at 2000 ft from just a little later when they start coming from a stack to the east of us. We don’t know what each route is doing to reduce constant, repetitive flights over individual areas (‘respite’). we don’t know to what extent Heathrow and City with CAA coordinate planning of routes and respite. My theory is that there is not coordination so City can argue we ‘only’ get 30% of their flights, while Heathrow can say we have respite from their flights 70% of the time. While on the ground in Forest Hill we actually get planes 100% of the time and don’t much care what their destination is. This is what I will take to the HACAN South East first meeting. When we moved to FH in 2001 we knew it was on a flight path but made the decision to move there. When we moved to rural Norfolk a few months ago we knew our world would smell of poo but still moved. To a certain extent we can make a decision to move to an area despite a negative factor, we can also choose not to move there. Would still love to know more about the suggestions for a solution to this ‘problem’. Other than a 10 yeah plan to build in the Thames Estuary of course. What else can be done. And what else would people like to see happen? I don’t think this is true. City and Heathrow take off and land in the same direction. Most of these go east to west, and in these cases South East London is on one of the Heathrow approaches (not usually directly over Forest Hill). When winds are reversed (the 30% case) we find ourselves on the landing route for City (not Heathrow), but usually (70%) they just come down the Thames. I have flown in from Amsterdam and taken this route - it is a great route as you get to see all of south London and turn over parliament (get a seat on the starboard side of the plane if making this approach). as seen in this thread, there have been significant changes in flightpaths and in the frequency and accuracy with which they are used, so things are not how they were as recently as 2016. I moved here 20 years ago, and one point is that the height (2000 ft) of City Airport aircraft over this area, and the intensity of use of their flightpath has changed to adversely affect this area. Indication in one of the letters above is that Heathrow has changed too. I don’t recall anyone asking us about this or seeing an impact assessment on noise levels in SE London. vary the line of the new concentrated City flightpaths so the noise is spread over different areas on different days. City landings to have a steeper landing plan. They seem to land steeper from the east than from the west. So stay at over 3000 ft until they reach the river and turn east to land. That’s 1000 ft higher - might help. Heathrow and City, with CAA be directed to coordinate their flightpath planning for easterly and westerly approaches taking into account the needs of all areas for concentrated flightpath respite. deny City and Heathrow increased morning flight slots until noise concerns are better managed. When future planes are quieter fine, but it’s jam tomorrow isn’t it. Proper publicly available noise monitoring data. No doubt plenty of ideas out there, but the most important thing is for places to discuss these issues, and for the voice of residents to be heard and taken seriously through representative organisations when these things are planned. A sort of environmental impact assessment to be published when plans are being made, with consultation to borough councils, special interest organisations (like HACAN) and so on. With due respect to the mighty intellect of we SE23 contributors I doubt that we will find a simple solution here, but if we don’t chip away at the undesirable or unintended impact others have on our environment, our worlds will continue to smell of poo forever. yes you are right about Heathrow on the westerly wind days I think. It’s not so cut and dried - some but not all landers go over us, and they join the final approach from both the north and the south. the flightradar 24 site shows this well. They do fly over FH quite high though- about 4000ft it seems, much higher than City flights. I know what you mean about landing at City lovely views indeed but if you use the City flight tracker for an east wind day (randomly just looked up 13 July about 08.00) you will see the new (since 2016 that is) concentrated flight path that goes west over Gravesend, Dartford, Bexley, Sidcup, Forest Hill, Brixton, then north to Vauxhall and Southwark, then turns east to the airport. All City destination flights seem to follow this exactly, wherever they are from. The path is directly over Forest Hill which is why I am banging on about respite! Think I will give everyone a break and give this a rest for a while- will report back from the 26 Sept HACAN South East meeting if anything interesting happens. A quick update. HACAN coordinated a public meeting in Kennington on 26 Sept at which most of the issues in this thread were voiced and more. There was support for a new body from London Assembly member Caroline Pidgeon who is deputy chair of the Mayor’s transport group. This was followed up by an inaugural meeting of HACAN South East this week at which we set up the new working group, as a federated group to HACAN, with some experienced campaigning and financial support from HACAN and access to their very strong knowledge of the issues, key organisations and individuals involved in flightpath planning. HACAN SE will also take up a couple of places on the committee of HACAN. 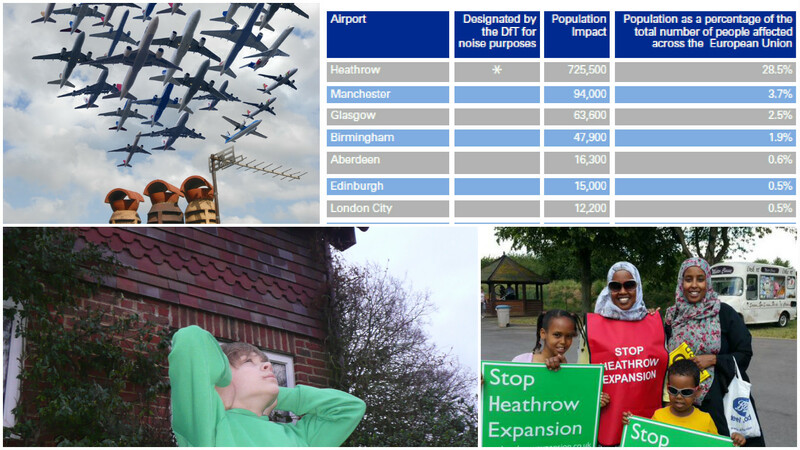 The reason to set up HACAN South East is to bring a local focus to campaigning and lobbying to the London SE area, in particular recognising that HACAN tends to be focused on Heathrow issues, while London SE areas have both Heathrow and City flightpaths to think about. I will continue to attend HACAN SE meetings- our next steps will include setting clear objectives for the group, and developing plans to influence decision and policy makers on flightpath issues that affect SE London. Part of what is needed will undoubtedly be keeping communities like ours informed of issues and upcoming opportunities to engage. Aren’t there any local forums in Norfolk? I am not sure, why? Apologies to late sleepers yesterday as I roared overhead on BA92 around 0612. I moved here in 2013 and it was rather sweet and quiet. Jump to present day and it’s absolutely awful. To the point I want to leave! My garden is no longer a place of sanctuary - we get fuel bommed and over the top noise pollution - and to top it off, it’s going to get worse if they want to extend Gatwick. Even though it should be Heathrow. Let’s see.